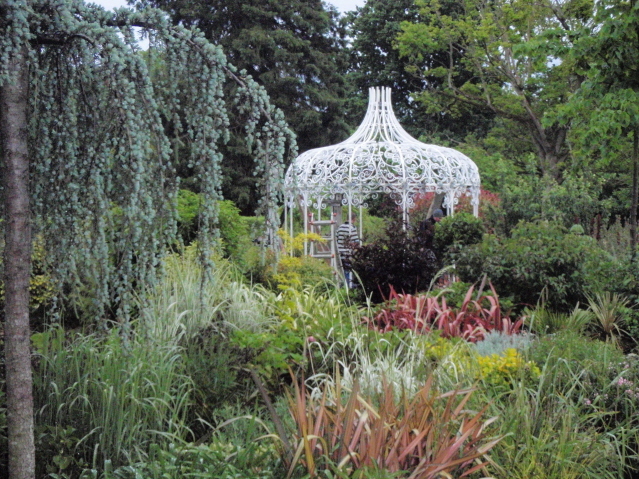 In 2007, the 27 acre estate gardens of Brackenstown House won 2 awards at National competition. The gardens designs, though they were intended to start some 300 years ago had, history states and shows, never been completed, until that is 2007. The two awards, an Award of Merit for Best Private Garden Landscaping and also for Best Overall Maintenance were awarded to Peter Donegan Landscaping Ltd for works completed and to Peter Donegan as the gardens Designer. In submitting the garden for award an A3 size bound presentation was submitted showing a history to the landscaping that took place to get the grounds to where and what the judging panel were now looking at and judging. Of note, the grounds had matured by the time judging took place. The photographs shown are all of works nearly (intentionally so) complete. At the time, technology was not what it is now and I guess the alternate is to leave the ‘gardens’ history sitting in a filing cabinet. It may more importantly prove of benefit to someone else in researching gardens of the 17th and 18th century. Something that I and others only know too well is very difficult to find indepth readings of. I have tried to keep the presentations layout as best as possible online, similar to that that I submitted at the time. What is not included here are and hundreds upon hundreds of photographs; and my drawings and plant legends. The latter for no apparent reason apart from they are very, very large and I don’t own a scanner of that size. This is but, the presentation. At the time of designing, [again] the internet was not what it is now. And as the gardens designs were never completed, there logically is very little of note on them. That said to the history of the house I owe much thanks to Finola and Turtle. You can view more information and phtographs of Brackenstown Gardens taken after the awards. I have also added some images in at the very bottom below, including the kitchen gardens handmade central pavilion (sometimes known as a gazebo), the final piece in the jigsaw outside of the planting and the changing of the sunken gardens pond sculpt, I felt. 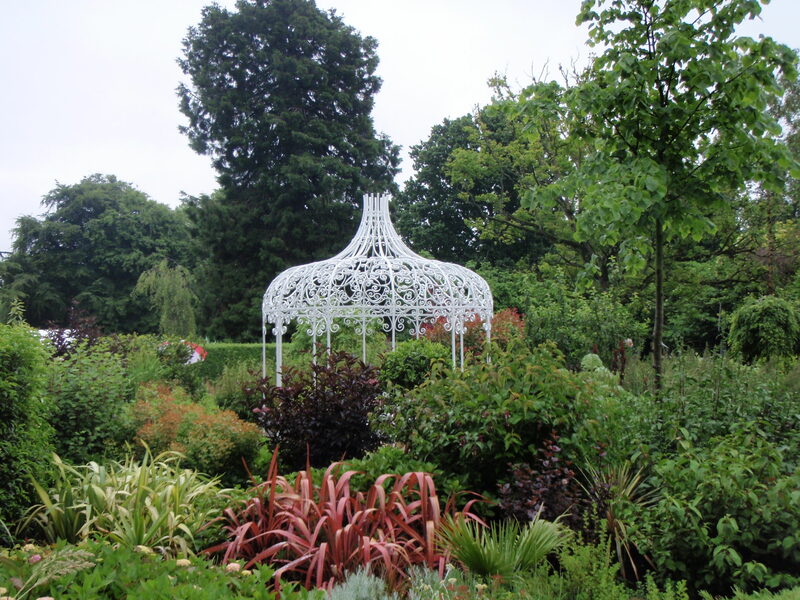 the work illustrates a consisted commitment to horticultural excellence in a restoration project that requires a keen understanding of the client’s requirements. The herbaceous beds in particular deserve special acclamation for their restrained but inventive interplay between colour and foliage texture. demonstrates a discernible excellence in maintenance. Another year over and what can I say?!! 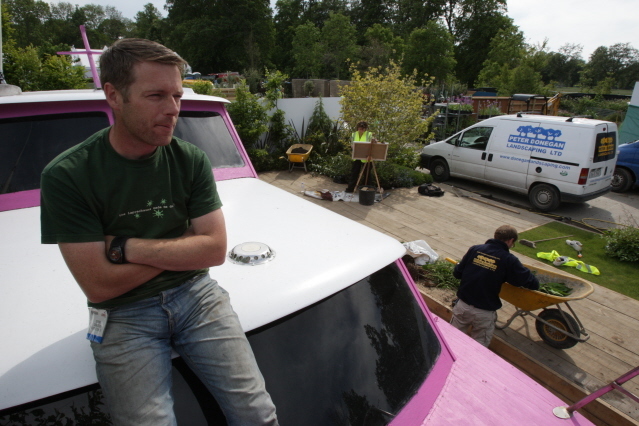 In short 2008 was the greatest roller coaster of a year since I first set up Donegan Landscaping over 8 years ago now. We had some really great,challenging and exciting projects to work on and that of course is down to really amazing Clients. I thank you all so much from the bottom of my heart. For the gardens created – you, your thanks and your smiles is what made it all so much more worth while. You have all been brilliant. Of course outside of that Bloom was only one of the contenders to steal the limelight. What started as a child like dream became a reality. And so the rollercoaster began 😉 Sponsorship was in place, designs were accepted and with weeks to spare… our sponsors decided not to. Par for the course I suppose. It did leave me in a slight pickle and with a very large boat in place already – I decided to go for it. Less so much money – medals were not on the menu. To complete a garden was. The response was overwhelming. And with a theme of recycling in mind, I ended up with a very different dilemma… That of finding a new home for a very large boat. It is here I must thank everyone who helped and also Rick and the 2fm team. Of course the finalé is what brought tears to my eyes. I am so very blessed for the friends I have. You may think it would end there. But it doesn’t. Quite recently I returned to South Africa with the Niall Mellon Township Trust. Once again it was a life changing experience. As I have said before all things ‘Peter Donegan’ went right out the window. I was one of over 2,000 people and I was part of a team. I was there to build gardens. I loved every second. It put life correctly inperspective. If I ever thought I had anything to complain about – I was wrong. Life has a new [and correct] meaning. With that in mind, I think it is only appropriate that I sign off in exactly the same way as I did last year…. 2008…. A good year? on one hand no business is ever an easy journey I suppose… but for the people I have had the pleasure to shake hands with this year; for those who stood taller by my side [DG/GC/DK] when life threw and odd one my way…one should really say it was a great year. Go raibh míle maith agaibh. Nollaig Shona duit. Slán agus beannacht. http://doneganlandscaping.com/wp-content/uploads/2013/02/donegan-landscaping-logo.jpg 0 0 Peter Donegan http://doneganlandscaping.com/wp-content/uploads/2013/02/donegan-landscaping-logo.jpg Peter Donegan2008-12-30 08:37:112012-06-07 15:36:482008, a good year...? So many times I hear people say they never knew I did this or that with relevance to ‘gardening’ of some form. This may sound like a sort of pitch – it’s more clarification – on the record. 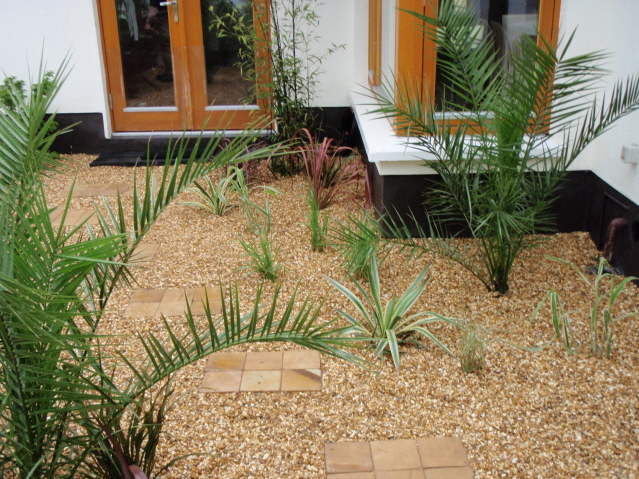 The company is called Peter Donegan Landscaping Ltd. But, maybe I should have called ‘the company’ Peter Donegan… anything horticulture or ‘gardening’ Ltd. Gardening consists of so many varying matters and subjects, which often firms chose to specialise in solely one aspect of. I choose to like *everything* done in-house and under the one roof. So what do I/ we do? consultancy: advice from domestic to commercial, whether considering a budget, design advice or simply the most general of matters. I know we know what we’re talking about. 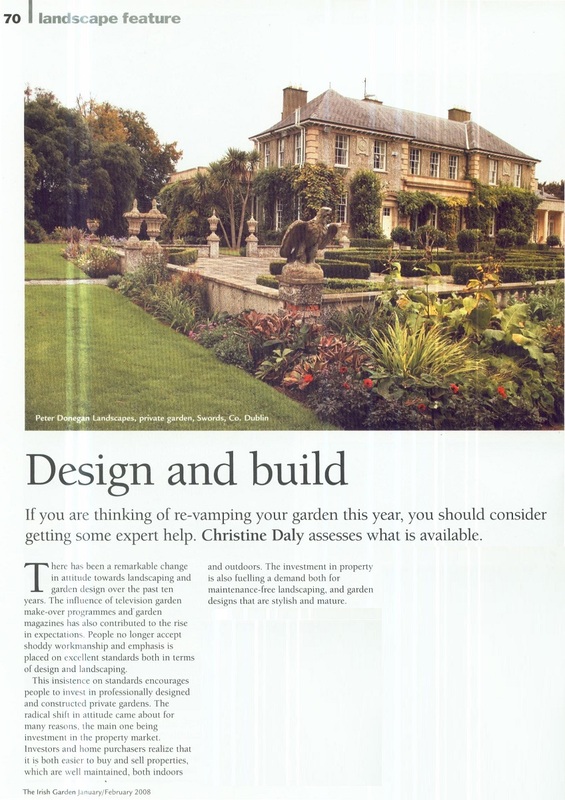 design: with numerous awards under our belts for garden design from domestic to commercial from large to small and historic to modern; it’s your space outside and our role is to get the best results from that budget and your space. maintenance: employing only the finest horticulturists, it is gardening, it matters and we do it. In fact unknowns to some we hold an award for this too! landscaping: the name says it all! 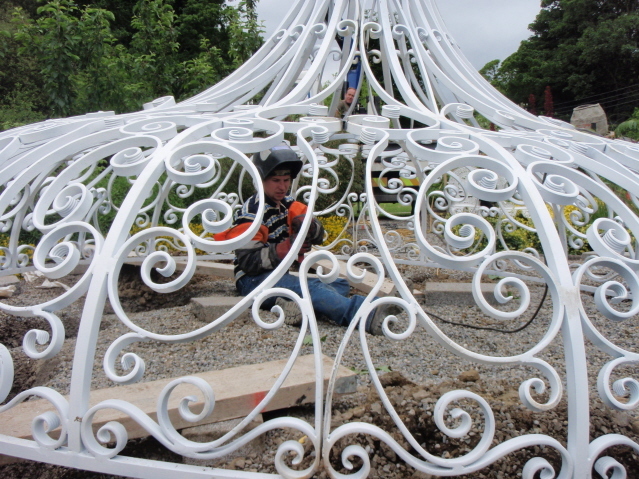 garden building, garden making, overhauls, revamps and re-creations… from the oldest to the boldest…. That’s the basics. But this can be broken down once again into project management, tree surgery, lawns, planning… but the reason why i only work with the finest horticulturists is so that the customer gets what exactly the customer wants. The way it should be. From Donegal to Galway, from Wexford to Dublin, even overseas… you are the customer – you can have whatever you want. If its not on the list, you like it, love it or want it, let me know. It may be in the weblog [search for it]. If I can help you – I will. In the meantime…. Thank you. Recently the gardens of Brackenstown got the ‘peace de resistance’ that [in my heart] it so much deserved. 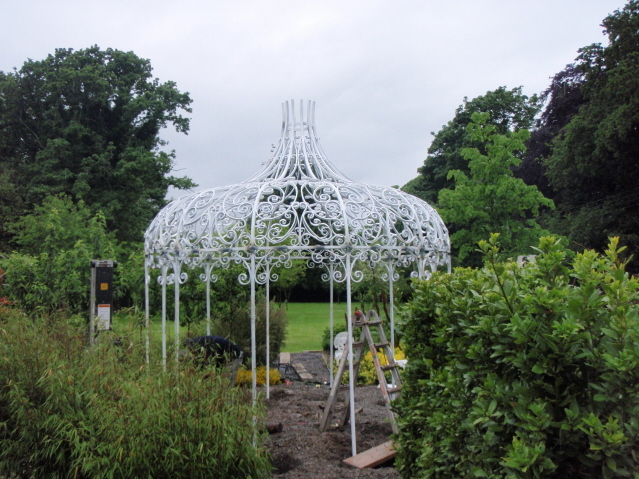 The gazebo was installed 2 weeks ago in the centre of the tranquility garden after almost eight months since it was first considered. The funny thing I suppose was that within three days it was fitted, installed and painted as if it had been there all its life. When it is found difficult to believe that the life of the structure is one of such youth, I suppose it could be said that the job has been done and done extremely well. It is bespoke, the only one in the world and hand made, the old style way. Credit when taking on a project like this must go primarily to ‘any’ client who has that ‘je ne sais quoi’ and forward vision to trust in a designer to bring something like this to fruition. I shall rephrase, when one does not know what the final outcome will be [obviously] and one has never seen ‘one’ before, it can be, difficult if you chose; only in the sense that if you are a ‘I need to see it first’ kind of person. 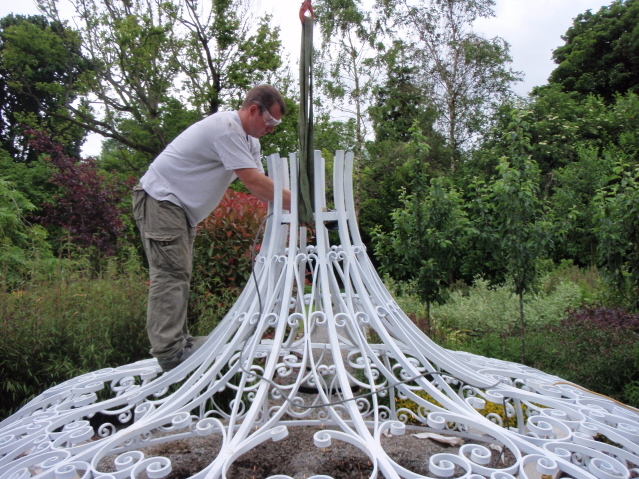 If not, bespoke features for a garden are one off, special, specific, of true splendour and yours [and yours only]. 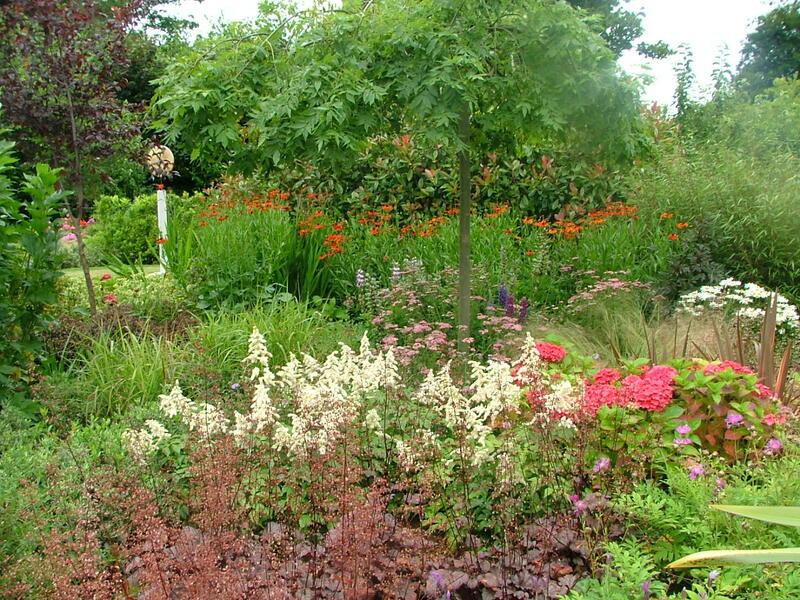 The award winning gardens of Brackenstown have hit the big screen. 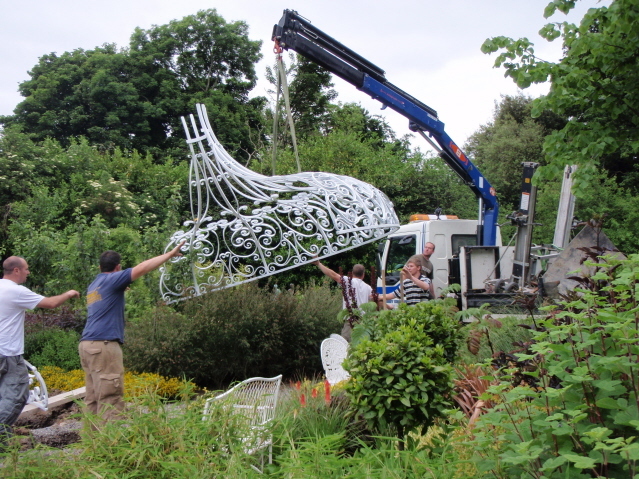 The gardens open for two weeks only for the Mid summer sculpt exhibition and this is one not to be missed. Tickets are limited and must be booked in advance through Gormleys Fine Art. Oliver is right, ‘what a setting’!